I’m fascinated by what people feel is essential in their kitchens and how that changes as our lives and cooking styles do. I live quite happily without a microwave, something I couldn’t have imagining when I was in my 20’s, and semi happily without a dishwasher or kitchen aid but I couldn’t do without my cast iron pan, or kitchen knives. I think you can tell a lot about people by what is and is not in their kitchen because this week, I have no food inspiration for you, I’m going to start an occasional series where I’ll talk about how and why I have some of the things I do. This has been prompted by a couple of articles floating about on how to live in small spaces or deal with small kitchens. One of the key pieces of advice is to get rid of things that only have one use and/or are bulky, such as a salad spinner. Generally, that’s good advice and up until this summer, I’d have agreed on the salad spinner. It wasn’t a problem that applied to my kitchen anyway, I didn’t have a salad spinner because salad leaves came in bags washed and ready to eat so I wasn’t going to wash it again. Then came the allotment. 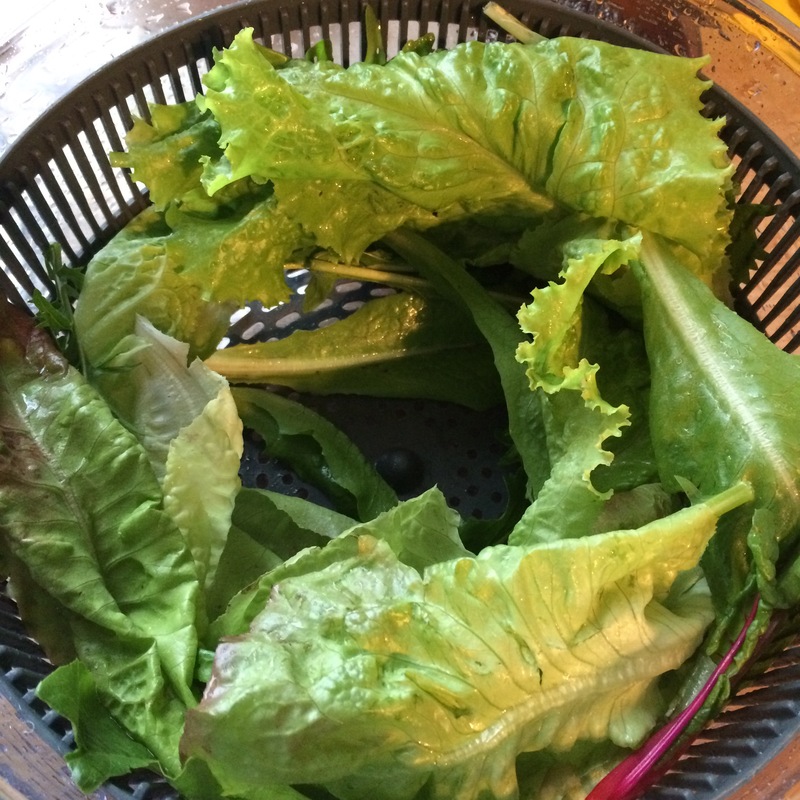 Salad is pretty easy to grow, so I sowed the seeds and it grew and grew and was awesome. What was not awesome, washing the salad. Well, washing it was fine, drying it was impossible. I tried to dry it with tea towels but it wasn’t really effective, so while the leaves tasted great I always had watery dressing and that my friends, is not a good thing. I did drop birthday hints about my need for a salad spinner but my loved ones ignored those hints and bought me whiskey and gin, it would be churlish to moan about that, so I didn’t and bought one myself. I ended up buying this one from Clas Ohlson and hands down it has been the most useful piece of kitchen kit I’ve ever used. With winter coming, I’ll go back to buying it like everyone else but next summer, it’ll be back to being the best piece of kitchen equipment I own and you will tear it from my cold dead hands! This entry was posted in How I Live, Things I Like and tagged cooking, food prep, home, kitchen equipment, stuff, things I can't do without, Things I Like, things I need. Bookmark the permalink.